Join us for a new karaoke experience. Instead of singing with a track and viewing your words on the screen, you get to sing with live musicians backing you up on guitar. They are both very talented and have a combined song list of over 150 songs. The way it works- come in, look at the book of songs, sign up for a song, get up and sing the song. We have all the words typed up for you on an iPad. If you need a little help, Apple is a great back up singer or duet partner. If you’re lucky, Atara or Sandoval will also be hanging out and they make great singing partners for those of you who are intimidated by the thought of singing with a live band. Live band acoustic karaoke is one of my favorite nights. It’s chill, the music is not too loud and you really get to feel like a star- like Jack Johnson or Colbie Caillat. Our venue is small, so we can’t do a big “rock band”, acoustic karaoke is the perfect fit for our neighborhood spot. If you have not been down on a Tuesday you have to come and check it out. Plus you have Jenny and Duff working behind the bar, the friendliest bartenders on the planet. There are weekly shot and drink specials to accompany your night of singing with the band. 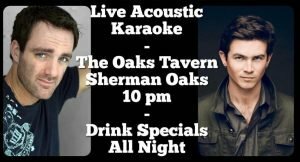 For those of you who are singer/song writers, you are welcome to bring your own guitar if you want to sing an original song… you just have to sign up on the karaoke list and when it’s your turn you get the stage to yourself. Unfortunately we do not allow “sets”- you just sing in rotation with everyone else. Live Band Karaoke Every Tuesday!